Srinagar: President Peoples Democratic Party (PDP) and former chief minister, Mehbooba Mufti has said that Kashmir youth needs opportunities, not guns. “Choking political space and expecting achievable solution is to live in a fool’s paradise.” she said, while addressing the youth gathering at her house. Hundreds of youngsters carrying placards “Youth for Peace” also showed up at former Chief Minister’s house. While seeking revocation of ban on religious organizations like Jamaat-e-Islami, she said that curbing or banning religious organizations won’t help in the facilitation process. 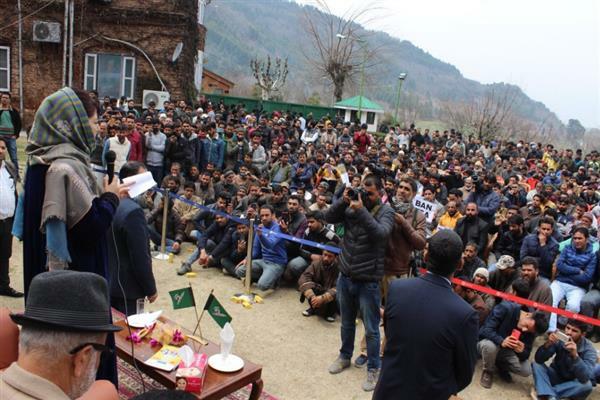 Mehbooba further added that the state is going through the worst of times and peace can only prevail when space is given to different ideas and not by bans or curbs. While terming the ban on Jammu and Kashmir Liberation front (JKLF) as detrimental, Mehbooba questioned the ban on Yasin Malik’s organization. She said that steps like these will only turn Kashmir into an open air prison. Talking about electoral processes, she said that PDP has decided not to participate in some Lok Sabha constituencies just to keep the communal forces at bay. “People are the best judge. They know whom to vote” said Mehbooba. Among others, Nayeem Akhtar, Safina Beigh, Aijaz Mir, Youth President Waheed Para, Nazir Yatoo and others spoke on the occasion.